Photos from Saturday 22nd September at Oulton Park, my local circuit and a fantastic place to spend a day in the sunshine. Highlights for me had to be the gorgeous little Simca Rallye 2 (Daniel Burrows) and the Lancia Fulvia of Pietro Caccamo - it sounded simply glorious in full flight accelerating up Deer Leap. Some photos below, click for the full set! The Nissan Silvia. The reason it's so fast is the rocket behind it. Nissan don't just make cars. In fact they designed and manufactured the rocket launchers for Japan's interplanetary space probe, which is currently observing Halley's Comet. The same advanced technology has gone into the production of the Silvia ZX Turbo. A true sports car that performs as well as it looks. 0-60 in 8 seconds and 130 mph from the 1.8 fuel injected turbo. That's why Car Choice said "a blisteringly quick powerhouse". But the power has to be tamed so you can handle it all. "Its excellent chassis combines sharp, well-balanced handling with an absorbent ride" wrote Motor Magazine. They also found that "Nissan seem to have got it right where it counts: the Silvia grips the road in a way the Japanese never used to. Always poised, never once did it feel unsettled by a surfeit of power." And all the time you're travelling in space, cossetted by sumptuous new seat fabric and trim, with stereo sounds that are out of this world... "A radio and cassette player imposing enough for Apollo XVI" said the Sunday Express. 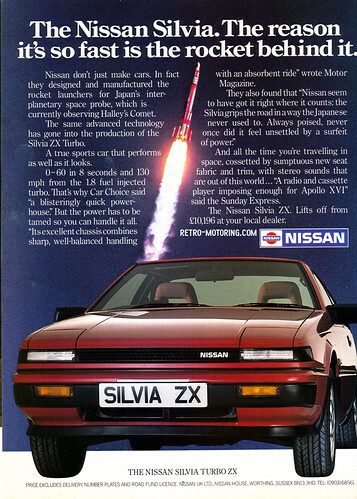 The Nissan Silvia ZX. Lifts off from £10,196 at your local dealer. 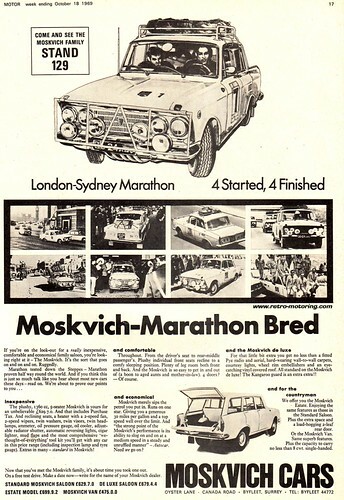 If you're on the look-out for a really inexpensive, comfortable and economical family saloon, you're looking at it - The Moskvich. It's the sort that goes on and on. Ruggedly. The plushy, 1360cc, 5-seater Moskvich is yours for an unbelievable £629.7.0. And that includes Purchase Tax. And reclining seats, a heater with a 2-speed fan, 2-speed wipers, twin washers, twin visors, twin headlamps, ammeter, oil pressure gauge, oil cooler, adjustable radiator shutter, automatic reversing lights, cigar lighter, mud flaps and the most comprehensive 'we-thought-of-everything' tool kit you'll get with any car in this price range (including inspection lamp and tyre gauge). Extras in many - standard in Moskvich! Throughout. From the driver's seat to rear-middle passenger's. Plushy individual front seats recline to a comfy sleeping position. Plenty of leg room both front and back. And the Moskvich is so easy to get in and out of (a boon to aged aunts and mother-in-law). 4-doors? - Of course. Moskvich merely sips the petrol you put in. Runs on one star. Giving you a generous 30 miles per gallon and a top speed well over the limit. And "the strong point of the Moskvich's performance is its ability to slog on at a medium speed in a steady and unruffled manner" - Autocar. Need we go on? For that little bit extra you get no less than a fitted Pye radio and aerial, hard-wearing wall-to-wall carpets, courtesy lights, wheel rim embellishers and an eye catching vinyl covered roof. All standard on the Moskvich de luxe! The Kangeroo guard is an extra extra! We offer you the Moskvich Estate. Enjoying the same features as those in the Standard Saloon. Plus the extra space and a load-hogging 2-leaf rear door. Or the Moskvich Van. Same superb features. Plus the capacity to carry no less than 8 cwt. single handed. A beast of burden doesn't have to look like a mule. It's only human to think that useful things can be ugly. And it's only Italian to believe that everything should be as beautiful as possible. Hence the Lancia Beta HPE - the Italian High Performance Estate. Being an estate car, the HPE will seat five people. But it does so in quite un-estatelike luxury. With fitted carpets, cloth upholstery (PVC if you prefer), integral headrests on the front seats and wrap-around rear seats that are as far away from the usual estate car 'bench' as you can get. Being an estate, the HPE carries a lot with the rear seats folded - 42.36 cu. ft. to be precise. But unlike most estate cars, you can also fold just one seat to carry a long load and a third passenger in complete comfort. There are also self-levelling headlights to stop you dazzling approaching drivers when the back is loaded. But being Italian, the HPE doesn't look remotely like an estate car. In fact, it looks much more like a sleek sports coupé, which is exactly what it performs and handles like. The 2000 version has a sliding steel sun roof. A top speed of 115mph. A 2 litre twin overhead camshaft engine, driving the front wheels. Five gears. All-round independent suspension. All-round servo-assisted disc brakes. And full instrumentation, including electronic rev counter and clock, with oil level, oil pressure and oil temperature gauges to protect the lubrication system. The 1600 has a smaller version of the same engine, its own distinctive alloy wheels and costs a little less. 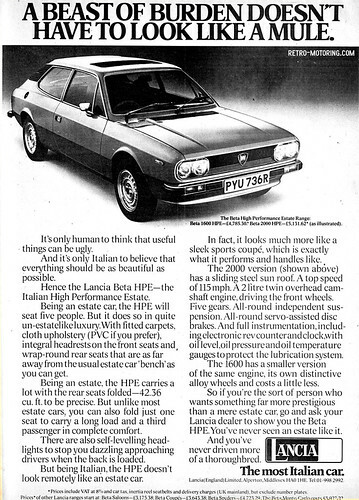 So if you're the sort of person who wants something far more prestigious than a mere estate car, go and ask your Lancia dealer to show you the Beta HPE. You've never seen an estate like it. And you've never driven more of a thoroughbred. Whether you treat yourself to the 2 litre or one of the 1.6 litre models, here is a coupe that's quick off the mark. The 2 litre accelerates from 0-50mph in 7.7 seconds, its 'fast action' 5-speed gear box giving smooth response. The secret is Mitsubishi's revolutionary counterbalanced 'Silent Shaft' engine. You enjoy the smoothness of a V8 with the economy of 4 cylinders. And a top speed of 105mph. The Celeste's superb roadholding is enhanced by wide steel braced radial tyres and powerful dual circuit servo brakes. With 35mpg at a steady 60mph on 93 octane petrol, you can even forget about those expensive 4-star pumps. Unlike a lot of coupes that look racy the Celeste won't cramp your style. It's a full four seater, not a 2+2. It's got a hatchback and the back seat folds down to offer even more luggage space. The front passengers can relax in fully reclining, cloth upholstered bucket seats. Head restraints are standard. The push button radio will help to shorten your longest journey. Standard features on all models include adjustable steering, laminated windscreen with tinted glass, lockable petrol filler, 'door open' and handbrake warning lights and something else designed to save you money - a full 12 month unlimited mileage warranty and 5,000 mile service intervals. 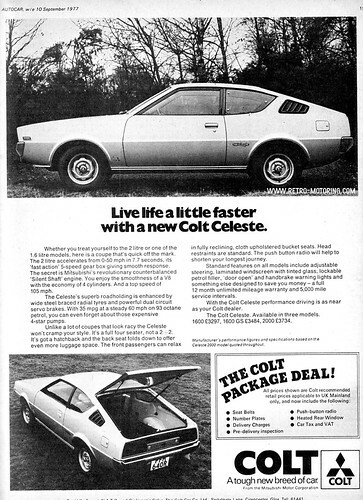 With the Colt Celeste performance driving is as near as your Colt dealer. The Colt Celeste. Available in three models. 1600 £3297, 1600 GS £3484, 2000 £3734. A fantastic few hours in the sunshine, courtesy of Wallasey Motor Club who have been organising this event for 31 years now. Some photo highlights below, but click here for the full set.